A woman who died after leaning out of the window of a moving train was hit by a tree or branch, an inquest has heard. Bethan Roper, 28, was on her way home from a Christmas shopping trip with friends in Bath when she died on 1 December. 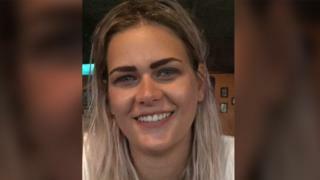 The charity worker, from Penarth in south Wales, suffered serious head injuries while travelling between Bath and Keynsham. She was pronounced dead at Bristol Temple Meads station. An inquest into her death was opened and adjourned at Avon Coroners' Court in Flax Bourton. Miss Roper worked for the Welsh Refugee Council, having graduated from Cardiff Metropolitan University in 2013. She was also a campaigner and was chairman of Young Socialists Cardiff. Last week her father Adrian said: "She was beautiful in every way. Our pain couldn't be sharper or more justified, but I know that her goodness and fullness of spirit will live on in our hearts and actions." The inquest will resume on 20 March and investigations into the circumstances of her death continue. The incident was reported to the Rail Accident Investigation Branch (RAIB). British Transport Police and the Office of Rail and Road are also investigating.